PublicationsCompeting networks and political order in the Democratic Republic of Congo: a literature review on the logics of public authority and international intervention. Download Competing networks and political order in the Democratic Republic of Congo: a literature review on the logics of public authority and international intervention. Competing networks and political order in the Democratic Republic of Congo: a literature review on the logics of public authority and international intervention. 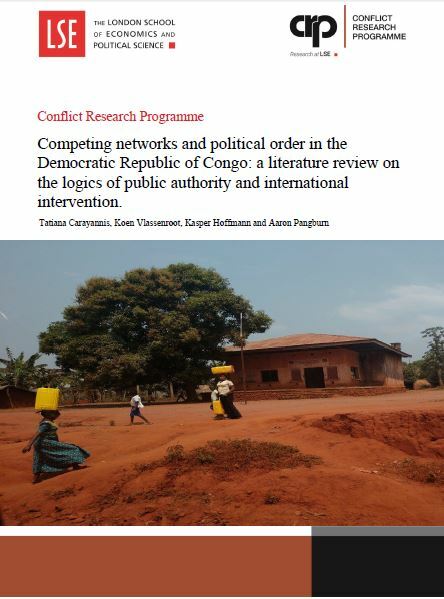 This CRP synthesis paper presents an overview of shifting dominant narratives on the Congo wars and the major findings of a systematic qualitative literature search on conflict and violence in the Democratic Republic of Congo (DRC) in relation to the political economy of public authority. It identifies gaps and limits in the existing literature and engages in current debates on peacebuilding and peacemaking strategies and policies. The paper shows that there are significant gaps in knowledge about the causes of conflict and violence in DRC and that this hampers the effectiveness of international attempts to support peace and stability. It argues that even though they constitute important contributing factors to the production of violence and conflict, the three logics of public authority (the logics of the political marketplace, moral populism or exclusivist policies, and civicness, or what we call citoyenneté) are poorly understood. These logics manifest themselves in and operate through trans-boundary power networks that alternately compete and collaborate with each other over public authority, people, territory and resources. Competing networks and political order in the Democratic Republic of Congo: a literature review on the logics of public authority and international intervention. (Conflict Research Programme, July 2018).